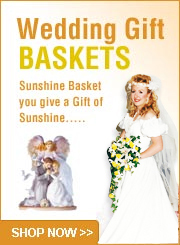 How do I contact Sunshine Baskets? We are here to assist you with any questions or problems you encounter and will do everything possible to make your shopping experience a pleasant one. Feel free to call us toll free at 866-621-1293 or 702-656-7783 or 702-349-3227. We are happy to help. I’ve already placed my order, but I’d like to cancel it. What is your cancellation policy? Each order is customized to meet your specifications and therefore cannot be cancelled. Should you need to cancel an order after we have purchased the items and/or designed your gift baskets, you will be billed 70% of the total amount of the order. I forgot my anniversary/Uncle’s birthday/cousin’s graduation gift. How quickly can you deliver a basket? Same day delivery is available Monday through Friday when ordered before 12 noon. Delivery on Saturday and Sunday is also available. Delivery to all hotels, casinos, businesses, hospitals and residences in Las Vegas and North Las Vegas is available 6 days a week throughout the year and 7 days a week during the holiday season. A hotel fee of $3.00 per basket is included in our delivery fee and is shown in the fee schedule to casinos/hotels. We are located in Las Vegas, Nevada and we deliver all throughout the United States. We hand-deliver our baskets locally (in the Las Vegas and North Las Vegas areas) and ship nationwide using Fed-Ex and USPS. Unfortunately, we do not ship outside of the United States at this time. I love your baskets, but there’s something special that I would like to add. Are they customizable? Yes. We try to maintain a variety of baskets, but if you don’t see something you like, we would love to put together a basket especially for you. And if you see an almost-basket – a basket that’s almost perfect but not quite – we’d love to fix that for you too. You can add a bottle of wine or champagne to an existing basket, or a box of chocolates – or anything else that you feel would make the gift perfect. I don’t really know what to say for the message on the card to accompany the flowers I ordered. My sweetheart is really upset. Can you help me get me out of the dog house I am in? We will be happy to choose a card for you from our selection of designer greeting cards we have in stock. Along with the flowers and card, you might want to add a box of truffles or a sweetheart balloon. 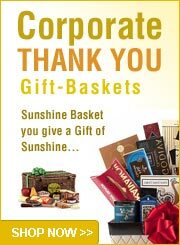 I just love your corporate gift baskets! I have clients in several states. If I order 3 gift baskets today, when will they ship? We work with your time schedule. Normally we would ship within 24 hours Monday through Saturday. Tracking numbers are provided for your convenience. I need to order 75 baskets for a meeting we are having in Las Vegas. Do you offer any volume discounts? Yes we do. Please call me to discuss as we have a couple of programs in place. I want to have a totally customized gift basket made for someone who has dietary restrictions. Do you make baskets for Diabetics? Yes we do all kinds of baskets for persons who either prefer certain foods or have dietary restrictions. This is a part of our personalized shopping service. I want to order a birthday basket for a friend of mine and want to make it extra special with a box of chocolate truffles and some brownies. Can I add these to the “It’s Your Day” basket? You sure can. 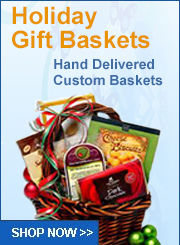 We are pleased to customize any basket and we design all baskets fresh as ordered. Prices may vary for customization. If I order my basket online today, can you deliver it right away? Orders received by 11:30 A.M. can be delivered same day Monday through Friday. Depending on our work load for the day we may even be able to accommodate same day service up until 1:30 P.M.
My Mothers favorite color is sunshine yellow. Can you design a basket using this color? Absolutely! We are pleased to design your gift basket and flowers using your requested colors. We carry a large selection of ribbon colors and decorations.